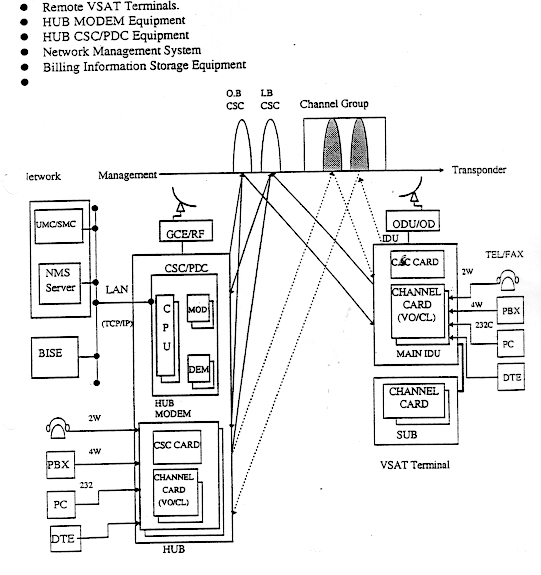 CSC:- it is the card that is resbonsable for communication between the vsats and the hub on the IB and OB channels .it controls the voice and data cards. IB channel:- csc at VSATS sends the data to the hub on it.it works by SLOTTED ALOHA. OB channel:- hub sends the data on it to all vsata.it works by TDM.OB channel can support up to 8 IB channels(see slotted alloha and TDM to know the reason).DAMA POOL:-range of freqencies reserved by the system on the satellite to transmit data on it. PDC (Primary Dama Controller):- unit responsable for managing the DAMA POOL and to assignes channels with different band width to voice and data cards at the VSATS. 1st if the voice card was connected to telphone and it is picked up and a number is dialed ,the voice card will send a call request to the csc responsble for him.Then the csc will send the request with the called number on the IB channel to the CSC/PDC in the hub.The PDC will check if the called adress is not busy and if there is enough bandwidth in the freqency pool.If every thing is ok it sends on the OB channel to CSC at calling and called remote sites to make a link between the specified two voice cards on a specified channel . After the call is finished the same thing is doing to free the channel in the DAMA POOL and making it accesable for another link. 1)Point To Point:-Full duplex sattelite channel will be assigned between two dedicated points. 2)Broad Cast:-one transmiter N reciever can be specified. 3)One Way:-Half duplex sattelite channel will be assigned for one transmitter and one reciever. 1)DAMA:-channels are assignd upon request based on the first come-first served. 2)Sceduled DAMA:-With the scedule table with in NMS(Network management system),NMS will automatically assign sattelite resources to the reserved application in the table. 3)PAMA:-At spicified time in the day,sattelite resources will be assigned to the reserved permenant application.